The first Paranthropine was discovered by Robert Broom in 1938 in South Africa. Due to their extreme anatomical adaptations they appear to be an evolutionary “dead end” (Stanford). Paranthropines are bound by their cranial features related to feeding adaptations that enable maximum force at the molars. Scientists believe that these adaptations allowed the Paranthropines to survive during times when not much food existed because they were specialized for eating a kind of food that other hominids could not eat. These fossils are currently grouped into 3 species dating 2.7 – 1.0 mya. 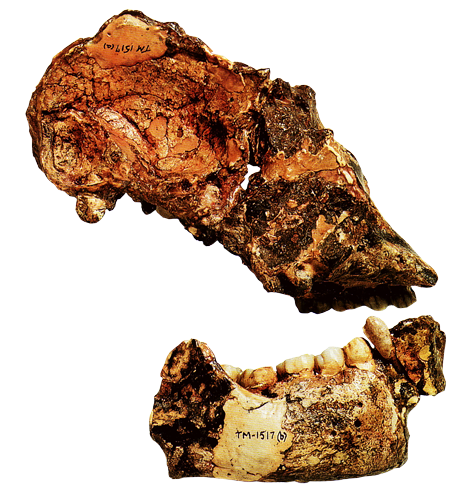 The 2 east African forms, Paranthropus aethiopicus and P. boisei, and the South African Paranthropus robustus are represented by hundreds of fossils. All fossils display megadontia (larger postcanine teeth than expected for body size) and cranial adaptations for pronounced masticatory structures (Fuentes). 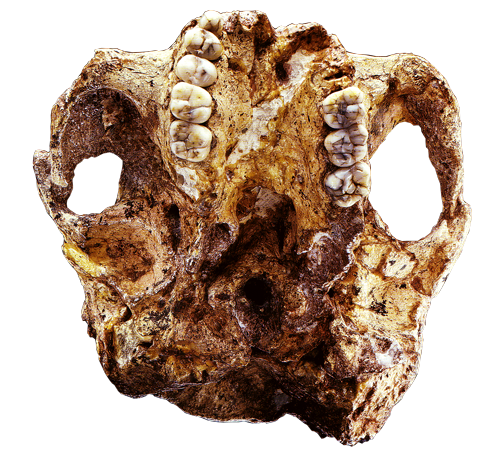 In 1985, a hyper – robust fossil hominid was found on the west side of Lake Turkana in east Africa by Alan Walker and Richard Leakey and was originally assigned to the species P. boisei. This fossil was called the “black skull” because of the coloration of the rock in which it was found. 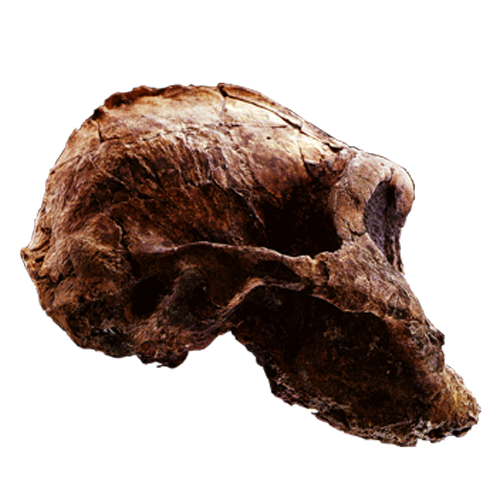 Dated to about 2.6 mya, this cranium shows a number of derived characteristics relative to earlier hominids, but it has strong similarities to a later east African form, P. boisei (Fuentes). It has a broad, dish-shaped face, almost no forehead, widely flared zygomatics arches, a pronounced sagittal crest, extreme facial prognathism, and very large molars. The species differs from other Paranthropines by being smaller brained (400 cc), a prognathic face, flat base, and large anterior teeth. 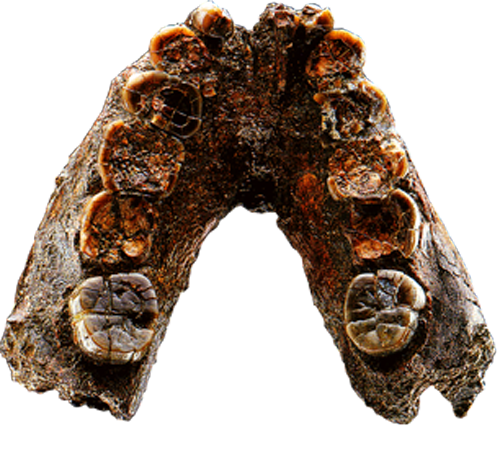 In addition to the black skull, this species is also represented by a few mandibles and numerous teeth found at 3 sites in east Africa, ranging from 2.7 – 2.3 mya. The single cranial fossil of P. aethiopicus has a braincase of approximately 410 cc. There are no known postcranial remains for this species. In 1959, paleoanthropologist Mary Leakey discovered a fossil cranium in Olduvai Gorge in Tanzania. 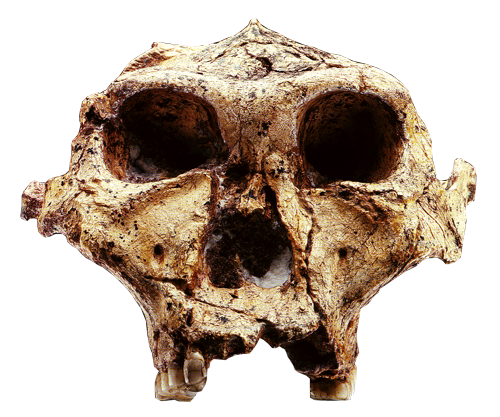 One of the best known hominid fossils, this skull was assigned to a species initially known as Zinjanthropus boisei. This find was of substantial initial interest because of the massive chewing adaptations on the cranium and the tantalizing possibility that it was the maker of primitive stone tools found in the same area (Fuentes). 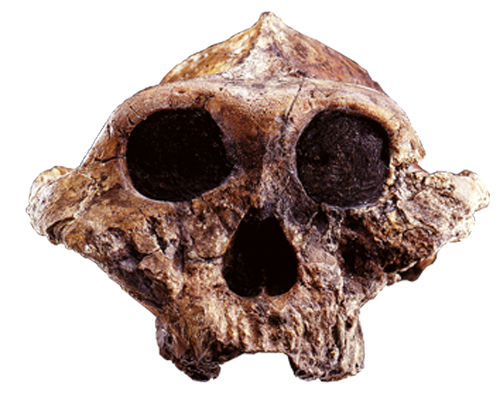 This species is known from multiple fossils, all from east Africa, dating from approximately 2.3 – 1.3 mya. P. boisei appears to have been somewhat sexually dimorphic, with males averaging approximately 4.5 feet tall and 108 lbs and females 4.0 feet tall and 75 lbs. It displays many of the chewing adaptations as P. aethiopicus, including a sagittal crest, flaring zygomatics arches, a broad face, and very large teeth. 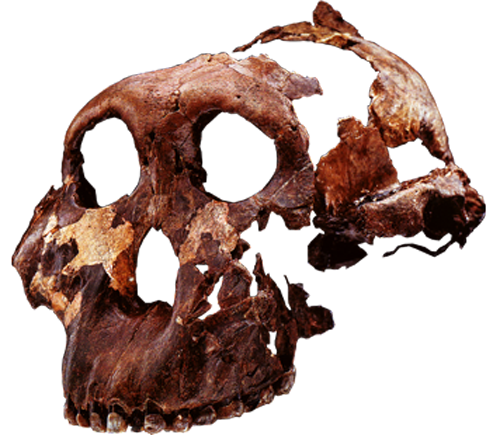 P. boisei possibly had the largest megadontia ratio of any hominid. A major difference between P. boisei and P. aethiopicus is in their degree of facial prognathism: P. boisei’s face was quite flat and protruded very little at the jaw compared to P. aethiopicus. P. boisei had very small incisors and canines with a relatively parabolic tooth row (dental pattern associated with later hominids). P. boisei represented the hyperspecialized end of the East African species of Paranthropines (Stanford). 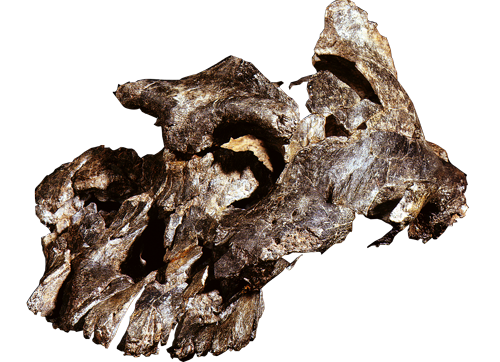 Known from Kromdraai, Swartkans, and Drimolen in South Africa, P. robustus is dated from approximately 2.0 – 1.5 mya. P. robustus differs from its East African counterparts in several minor characteristics including the shape nasals and browridge and the presence of bony pillars next to the nose (Stanford). P. robustus males averaged approximately 4.25 feet tall and 88 lbs and females averaged approximately 3.5 feet tall and 70 lbs. They have a flat face, small incisors and canines, a sagittal ridge, small forehead, and pronounced zygomatics arches. However, the P. robustus braincase appears to have been slightly larger than that of P. boisei (530 cc). The arms of P. robustus were longer than the legs (a primitive characteristic) but the feet and hands displayed remarkable similarities to those of later hominids. This robust hominid may have used bone tools to open massive mounds of hardened soil to extract termites (Stanford).